This Annual Report of CY 2009 is in essence, the realization of the Annual Investment Program that the stakeholders collectively prepared at the beginning of that year, and the last “slice” of implementation of the Medium-Term Development Program (MTDP) 2004-2009. It is also our State of Local Governance Report (SLGR), in conformity with the requirements, format and standards of the Department of the Interior and Local Government (DILG). 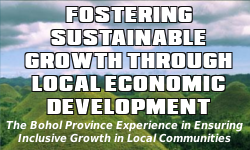 Just this year, the Provincial Government passed its Provincial Development and Physical Framework Plan (PDPFP) 2010-2015, a unified development and spatial plan. This is the plan that we will implement for the next six years of local governance and development, together with all our stakeholders in the Boholano community. This is also the plan that we hope to, gradually over the next six years, declare to have accomplished more and more of, with every Annual Report. I am trying to download a copy of PDC’s most recent Annual Report. Please will you be so kind as to forward it to me as soon as possible. I thank you in advance for your kind co-operation. 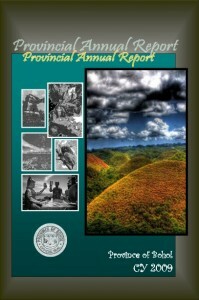 We do not have a Provincial Development Council (PDC) Annual Report but we do have a Provincial Annual Report, which basically contains the major accomplishments of the Provincial Government, including the detailed accomplishments of all Provincial Offices and National Government Agencies. The latest is for CY 2010. This can be found in our website under the “Documents to Download” sidebar area. Please let us know if you are having difficulty in downloading the file. Thank you. Thank you for your response to my request. However, i request that you kindly delete this post containing my e-mail address from your website. You clearly state on this correspondance tool: “Your email address will not be published.” And yet you have done so with my contact details. Thanking you in advance for your swift co-operation. Hi Vareshni. we’re terribly sorry for that. Your email address was published because you typed it in there with your message. The comment box will ask for your email address and that should be sufficient information for your comment will be accepted. No need to type it within the comment itself. Your comment has been edited to exclude your email address. We look forward for a better cooperation and harmonious relationship in partnership for the development of the Province of Bohol and its people. Thanks for your interest in the development of the Province of Bohol. A download link is now provided at the Annual Report 2009 web page. We hope the document will be of great use to you, your company and of course to the development of the Province of Bohol and for the good of the Boholano people.